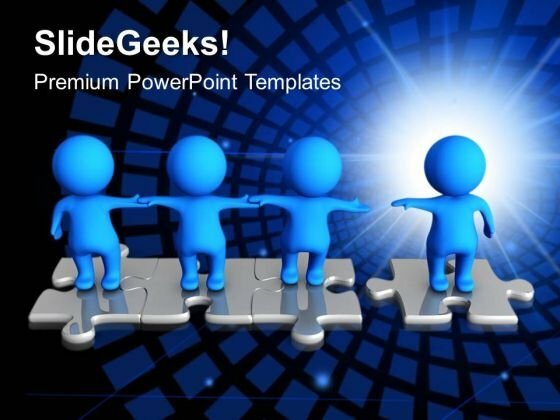 3D Men Standing On Puzzles Teamwork PowerPoint Templates And PowerPoint Themes 1012-Create stunning Microsoft office PPT Presentations with our professional templates containing a graphic of 3d men standing on puzzle and holding hands to to join the team or community. Use this template to show teamwork or cooperation. This template can be used used for presentations on business partnership, deals, business cooperation and negotiations. Our PPT images are so ideally designed that it reveals the very basis of our PPT template are an effective tool to make your clients understand.-3D Men Standing On Puzzles Teamwork PowerPoint Templates And PowerPoint Themes 1012-This PowerPoint template can be used for presentations relating to-"Business men standing on the pieces of a puzzle, puzzles or jigsaws, teamwork, business, people, success" With our 3d Men Standing On Puzzles Teamwork PowerPoint Templates And PowerPoint Themes 1012 you won't bat an eyelid. Display your ability with equanimity. Our 3d Men Standing On Puzzles Teamwork PowerPoint Templates And PowerPoint Themes 1012 encourage a creative environment. Allow diverse ideas to gain acceptance.